My Great Grandma started collecting first & I was given her small collection upon her death. One of my favorites was this model. I have her original (w/ pink muzzle), and another one (w/o the pink). I also have the matching scratching foal & lying down foal, of which were hers, and I've acquired a couple of my own as well. 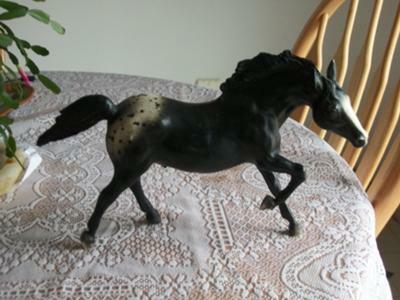 My Mom & I were always horse nuts and she helped me start my collection after she saw my interest in my Grt-Grandma's. I used my allowance money to go to Circus City (?) in the mall, to pick out a model on my birthday each year. I made the mistake of glossing my Stud Spider, Halla, and many other models.....live & learn. I also made another mistake when I became a fan of Ebay, and sold many of my orig models, and my Grt-Grandma's. Including....and here's another lesson -- the Running Stallion Red Road model, and the Scratching foal Red Roan model. dumb. Because I sold dirt cheap. I love horses still, can't have any yet (hubby doesn't care for them although we have room), and will always love them. I've passed the Horse crazy gene to my youngest daughter and she's building her collection as well now, although starting w/ smaller models, or dents & scratch models. Thank you Breyer. My horses have been the constant hobby in my life. Through thick & thing. I have that appy, too. I got him when I was around 12?...Now I'm 50. I still like to pick him up and look at him!!! I remember trading my neighbor for him, I had the laying down black appy colt, and I wanted the big guy soooo bad!!! she is soooooooooooo pretty where did you get here i had to go so i couldn't finish reading. Join in and write your own page! It's easy to do. How? Simply click here to return to Breyer Horse Collectors.